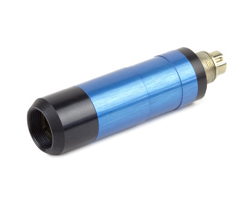 The BlueLyte from Global Laser provides a user friendly, reliable & compact laser module in the Violet/Blue wavelength range with a number of market leading features. Stable output power is offered over a wide temperature range with the additional benefit of a LC (Linear Control) control circuit. The LC control circuit allows you to control the output intensity linearly by applying a voltage of between 0 & 1 volt, to the control input. This same control circuit also provides analogue modulation with speeds in excess of 750kHz The output intensity will faithfully replicate any arbitrary signal you wish to apply with a 0-1 Volt amplitude and within the limits of the laser module’s maximum rise and fall time. The PWM version allows you to use pulse width modulation of the intensity from a TTL level input signal, within the limits of the laser diode modules maximum rise and fall time. You can therefore control the mean intensity of the laser beam simply by changing the mark to space ratio, modulate the laser with coded information or synchronize with external measurement device such as a machine vision camera. Further flexibility is provided by a choice of collimating lens providing circular or elliptical beams. The user adjustable collimating lens allows simple adjustment to provide a collimated beam or a focused spot at a required distance. A wide range of line generators and projection patterns are also available. 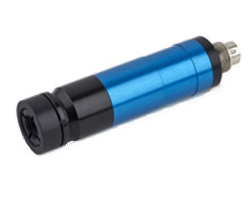 A wide range of output powers are available which combined with the compact 15mm diameter housing, robust industrial connector and choice of optional mounting clamps provides a complete blue laser solution.